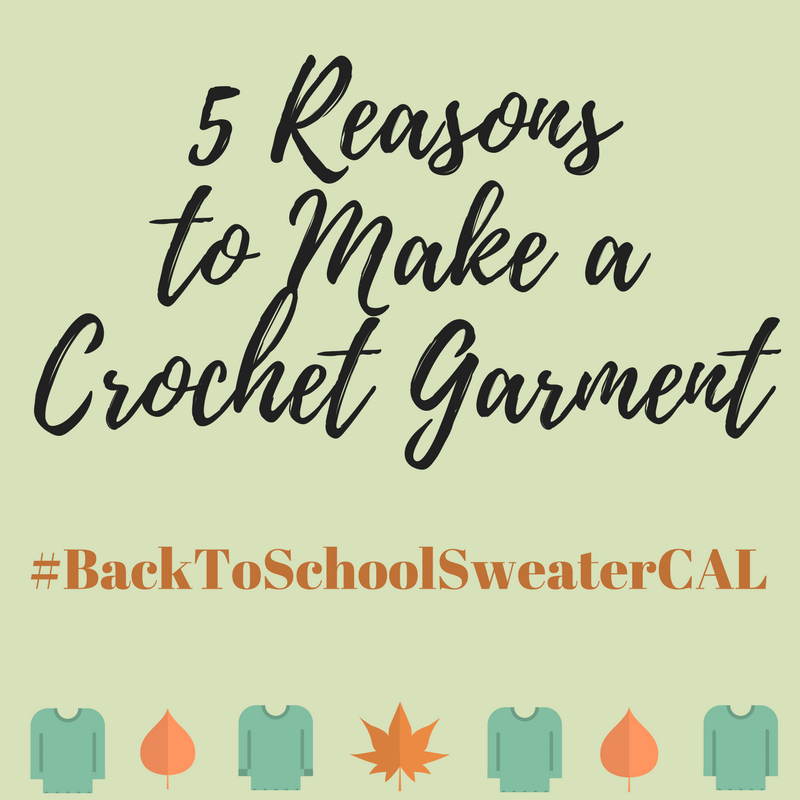 I'm really excited to be kicking off the Back To School Sweater Blog Hop with this first blog post in the series. Helen and I have had a super response so far from fellow crocheters who are planning to join us in the crochetalong starting on the 16th of September. But for those who are hesitating....and need that extra bit of persuasion here's my top 5 list of reasons to make a crochet garment. Making a garment that fits is, in my mind, one of the more advanced crochet projects you can undertake. There's just more involved with this kind of project including taking body measurements and making gauge calculations. You can make blankets and scarfs without ever calculating gauge - sort of winging it and end up playing yarn chicken and win or have to buy an extra ball. We've all done it. But with a garment it just won't fit if you don't calculate gauge. But please don't feel daunted by this because our blog hop is aimed at helping you to master these skills. Joanne and Kat from the Crochet Project will cover measurements and gauge in their blog post on 16th of September and Sam of Sing a Simple Melody will cover alterations in her blog post a week after that. You will be ready! 2 You have enough shawls, honestly you do! You have made enough shawls for yourself as well as other crochet-worthy family and friends. Be honest with yourself - do you need another shawl? I really love making shawls and I'm not going to stop anytime soon but if I am really truthful, and you should be too, it's time for another type of project. A handmade wardrobe has been very on trend in recent years. My sewing skills are not the best but I can join these hipsters with my lovingly crocheted handmade sweater. Now it's fashionable to have a more sustainable wardrobe. We buy fewer items and wear garments that last a long time. This suits me because I've never really been very fashionable, I don't like clothes shopping but I do like yarn shopping and now I get to be cool for the first time with my crochet garment. You are skillful enough in your craft to do this. Wear your crochet garment and own those skills. Enjoy the compliments when people ask you "Did you make that?" and you can answer with pride "Well, yes I did!" And if you've going to a yarn event it's almost obligatory to wear something that you made. The Rhinebeck New York Sheep and Wool Festival in October even has a name for the sweater you make to wear at their event "The Rhinebeck Sweater". I'd forgotten all about this but in our Ravelry group we have a crocheter who is making a garment specifically to show off at Rhinebeck! Our next stop on the blog hop, one week today on 2nd September, will be prolific crocheter Jo or @JoJoTwinkleToes as she is known on Instagram writing on her blog http://jojotwinkletoes.blogspot.co.uk/ about current trends, choosing a style to suit you and designers to check out. Plenty of inspiration is coming your way! Please do join us in the Ravelry chatter thread hosted in the Crochet Circle Podcast group which is become rather lively and if you're an Instagram fan we're using #BackToSchoolSweaterCAL We start three weeks today!! Mostly when people ask 'did you make that' it's because they can tell and they think it is awful! It's definitely not admiration a lot of the time. Some people don't have good aesthetics or skills and people say 'oh that's a bright jumper isn't it?' all day to them and then people say they get lots of compliments. There are now finally some good crochet garment patterns happening but not that many really. It's why people don't crochet them I'm afraid. They are often just too lacey and don't do the job of keeping you warm, or conversely massively big and weighty. Get it right and they can be as lovely as anything knitted. That is the challenge I guess. Also noticing how expensive patterns can be - £7 and £10 I have just seen for single items no variations and in the case of one a very simple vest top. Yes designers deserve to get paid and it is hard work but a good pattern sells itself over and over so no need to get greedy. Very poor value sometimes - garment making is already prohibitively expensive a lot of the time because of the cost of even 'cheap' yarn. Independent designers work often leads a lot to be desired too, with poor pattern writing, no testing and badly edited patterns being the norm. Would rather stick to commercial sector with long standing reputations. Despite it being trendy to use indie designers with unicorn fluff from indie designers. So will I be joining in? Probably not, but hopefully others will and they will successfully blaze a trail for the crochet cardie or woolly jumper. Thanks for your comment Marie! I think it's the longest one I've had on my blog! You've made some really valid points. It's true that picking out and making a flattering crochet garment is a challenge. The first one I made was horrific. I'd designed it myself, used really thick yarn and decided on big horizontal stripes. I must have been mad. I took a photo and ripped back the whole thing. And it actually put me off making a crochet garment for ages... but then I started to see amazing projects where the designers were getting it right, and my skills had improved and I had rather more success. Sounds like there is a tiny chance you might still think about joining us and being one of those trailblazers. Please do send me a message on Ravelry (I'm craftyescapism) if you'd like to discuss designs or yarn! Well looks like reason 4 - a handmade wardrobe is winning so far - selected by both Helen and Marta! Thanks for your comments my friends! Can't wait to read your blog posts later in the blog hop!!! Handmade wardrobe is number 3 (my favourite), you're all doing it to show off ;-) Great blog post! I hope lots of people will be inspired to have a go and I can't wait to see all the pattern choices. Thank you so much Caroline for your kind words. I absolutely agree with you and can't wait to see all of the unique handmade crochet garments that this CAL inspires! You are already doing a marvellous job spreading the crochet garment love with all the garments that you and Clarisabeth make! Another vote for number 3, the handmade wardrobe. Yes you guessed it number 4 gets my vote. I like showing off!! I cannot wait to be spending significant amounts of time each day monitoring and commenting on the #BackToSchoolSweaterCAL on Instagram......and checking in to our thread. Fun! Five brilliant reasons Tamara, not that I needed much encouragement! 😂 I'm another handmade wardrobe fan and I'm trying to have more handmade than shop bought clothes in my wardrobe - sewing and yarn based. This CAL is going to add very nicely to the plan! Thank you Jo! Glad you are joining in! I love your goal of having more handmade than shop bought clothes. I really want to get into sewing one day.... but crochet consumes me!! Ha ha! Thank you Jojotwinkletoes!! You do make fabulous scarfs, shawls & garments that's for sure! 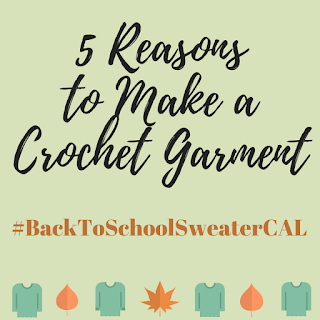 I'm really looking forward to seeing the sweater you're making for this CAL and reading your blog post next week! Thank you for being one of our bloggers helping to spread the crochet garment love!!! Thank you Lisa! It's wonderful to hear that my reasons are the ones that resonate with you too! I'm so happy to have you join us. Just over two weeks to go until we all get started! Yay! This is really inspiring. I need to get out of the rut of just making blankets all the time! Aawhhh thank you! Blankets are wonderful and I always have one on the go. But you really should give a garment a try too Emma!! I love your reasons you listed. I am looking forward to the post about gauges and measurements. I'd love to have one of those dress forms. Thank you Jacqueline! I'm happy to hear our topics are helpful!